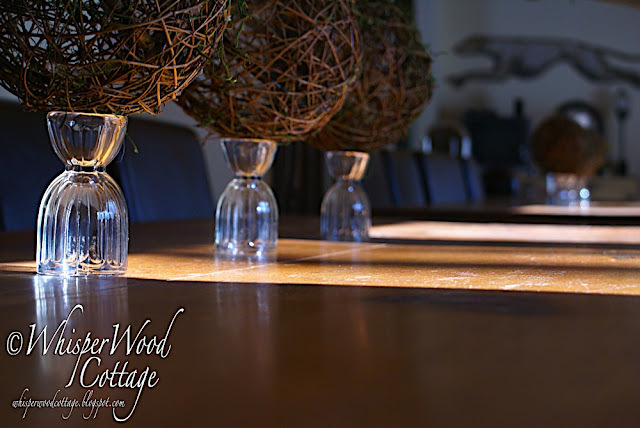 WhisperWood Cottage: What Can You Do with 4 Egg Cups? What Can You Do with 4 Egg Cups? and a box of grapevine spheres?" I also found this huge box of approximately 15 grapevine spheres at Goodwill for a screamin' deal. And by screamin', I mean glass-shattering, ear drum-busting chaos! When I was checking out, the cashier exclaimed, "That price for the whole box? I would have marked each of them that amount." I just smiled and said, "It's a great deal, isn't it?" So glad she wasn't the one pricing that day! I thought I would also get you some good shots of the Amish harvest table so many people have asked about. This actually was...Are you ready for this?...an ebay find! It is originally from an Amish family in Wisconsin. It seats 10-12 people, and it is one of my favorite pieces in the house. I adore the individual drawers (6 on each side and 1 on each end) in which the Amish family used to store each person's individual place settings. That would mean they used to seat 14 people at this table! So, get out those egg cups and put 'em to work in your decor! What happened to the other grapevine spheres? Very pretty. Love the combination of the sparkly crystal against the grapevine spheres. Your harvest table is killer! What an incredible find! 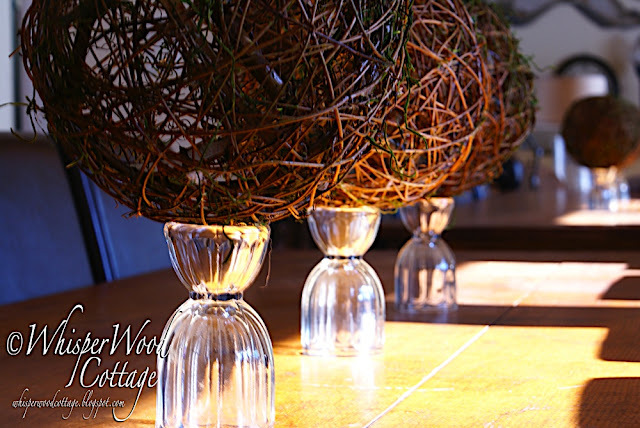 They look so pretty on your beautiful table, proudly holding the grapevine spheres! Oh why don't i have some egg cups and grapevine spheres!!! I just LOVE "screaming LOVE" what you did... and the table.... no words needed.... beautiful! Amy.. these are truly beautiful! That table is to die for. I love any and all things Amish. It just speaks to me for some reason. 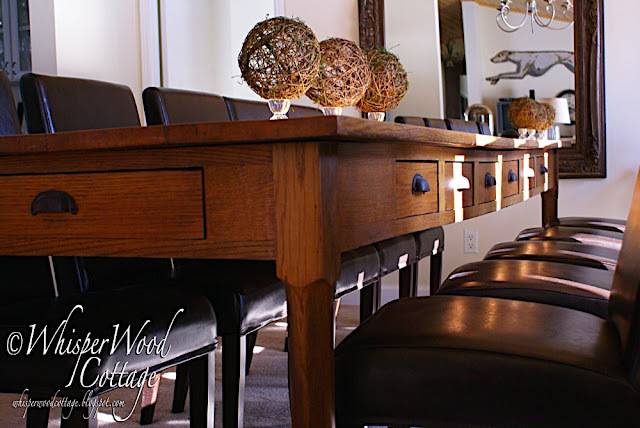 This is a marvelous piece and those drawers for the individual place settings are just great. Can you tell I love it? Hi Amy, I'm a camera junkie too...I recently took about 30 pictures of the same flower ball...Your grapevine deal is amazing, I just looked at similar ones at Michael's and they wanted 4.99 each, yeah right! Your pictures are great and the table really is awesome! I LOVE the table! My OCD type-A personality actually likes the idea of each place setting stored neatly in its very own drawer. Oh, what a pretty idea with the spheres and egg cups! Love it. Your table is to die for stunning!!! It is amazing what can be done when simple items are combined. I love love love your table. I like the way you have them displayed. Don't you just a great bargain! What a clever idea! The table is simply wonderful, and your photos turned out so well. Great idea, your photos are just beautiful! You have such clever ideas! And that harvest table...YUM. Hope you bring some of your great ideas over for our first ever linky party for clever ways to display and serve superbowl snacks!! Very lovely! The material mix is so special! Oh.my.gosh! That table is unbelievable. I've seen it in other photos, but I didn't realize it had all those drawers. Good grief...what a beauty. And, what happened to the fourth egg cup? Love your table...I didn't know the Amish used ebay! Ok, That table is to die for, I love golden oak, and all those drawers. BUT wait, what is that greyhound thing on the wall. We rescue greyhounds, and anything greyhound catches my eye. PUTTING THEM ON THE EGG CUPS WAS VERY BEAUTIFUL. IF YOU PUT A QUILTED TABLE RUNNER DOWN YOUR TABLE, YOU COULD TAKE A BEAUTIFUL SHALLOW BOWL AND FILL THEM WITH THE SPHERES WITH BOWLS OF APPLES ON EACH SIDE....IT WOULD BE GORGEOUS. So pretty! Very Pottery Barnish! I bet it was some guy pricing that day who was like "who would want a bunch of twisted old twigs?". The randomness of Goodwill prices kind of irks me, but you do find some awesome deals occasionally! Gorgeous table! We have a table with drawers (not that many, though!) that we keep napkins and trivets in. Very handy. Ok, I like the egg cups on the table, especially with the sunlight; however, I LOVE the table! It's awesome. I wish I had a place big enough for a huge table. Oh wow! I LOVE that table! 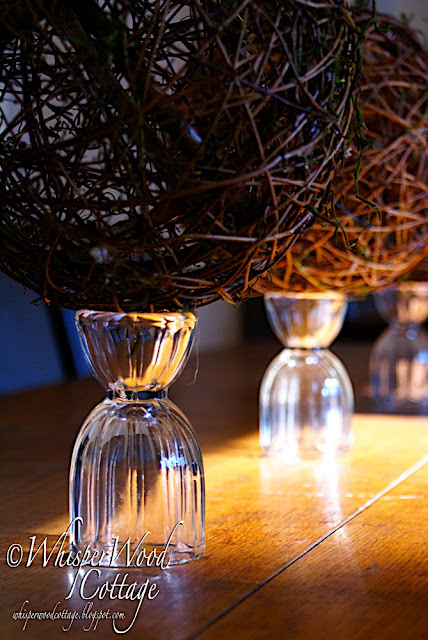 Great idea on how to utilize the egg cups and the grapevine spheres. Love the table! Can you imagine 14 people setting down for dinner every night? Love the egg cup idea! Thank you for sharing, great idea. I have some pine cones and a great dish. I'm off to the pantry. Thanks, I love the pictures too. What a great idea! I can't believe you found that whole box at Goodwill. Score! I also love the table. It is just beautiful. Nothing is better than a great deal. NOTHING! Well, okay, maybe chocolate. Fine. But a great deal is still awesome. And, my friend, you are Queen of Finding Great Deals!! I feel like curtsying every time I'm over here. I love that table. It is so gorgeous!!! What a great find. 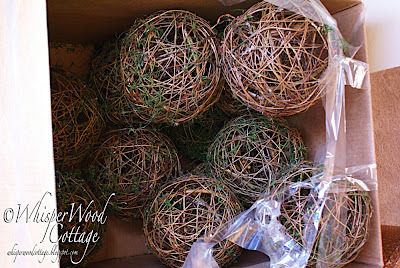 How great to find a whole box of those grapevine spheres for a good deal. I saw some yesterday but they were marked $5.99 each and were smaller. I need to do some thrifting. Can't wait to see what you used the rest for. What a delightful post. I'm not terribly familiar with egg cups, so I enjoyed seeing these. Also, the Amish table was very interesting and gorgeous! 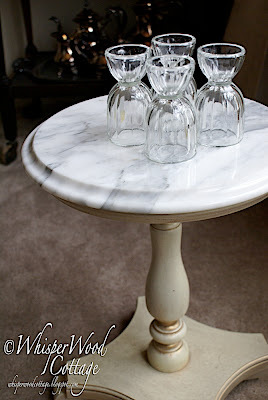 I love both the table and the egg cup idea! That table is really gorgeous and what a find! Why can't I ever find wonderful furniture like that on Ebay?! I love that the table used to belong to an Amish family and has a history. Pieces with a history are always the best kind! You've done it again. Another amazing idea that looks stunning. So what was that screamin' price? I recently got a find that I wanted to sneak out under my coat, it was that good. Great idea!! And this reminds me that I have got to get myself to the thrift store. 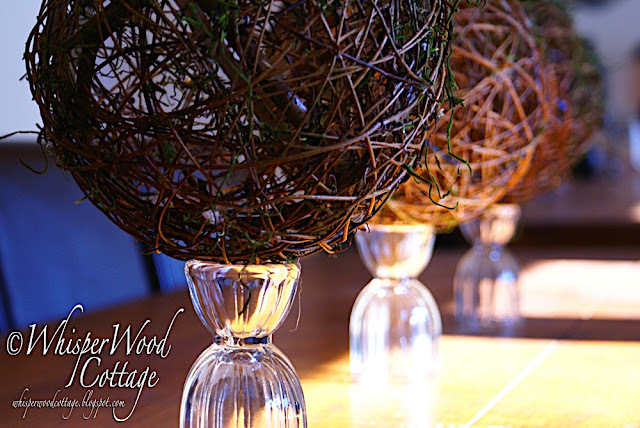 I just used grapevine balls and moss with some candle holders...check it out at my blog! What a wonderful Table scape! Simple, beautiful, perfect. 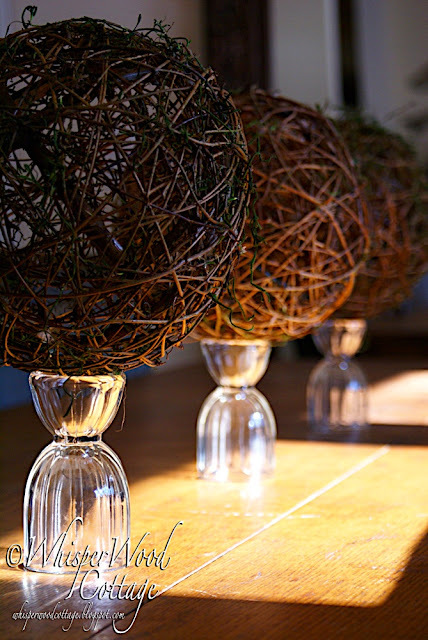 I have so many of those grapevine spheres in my house!!! I love them. Can't wait to see what else you do with them! Wow, those look great! Your photos are pretty amazing too! I love that marble top. I would have bought the table just for that also! What a great idea and I LOVE your table! Just BEAUTIFUL! Faaaabulous! Love the rustic charm of anything you touch. And I agree, that table? Amazing! So elegant, yet beyond what many of us would come up with. I like it! Thanks for linking up today with my blog hop. I love that table! It's such a great find! You are one lucky duck! Lovin the spheres and the table! Yesiree. oh dear such beautiful photos! the table just awesome..
Great photos and so lovely. Cool idea - looks great ! What a steal on those!! The look lovely together! Very pretty and completely unexpected! This is so beautiful! And, I just love your whole house, I love the mirror, I adore that table! please come by and show us more at our next party! thanks for linking up! I hope you continue to share your great ideas. Your table is absolutely to die for. Ebay? shipping?? It is awesome..
O, and i'm signing up to follow..please come see me when you have time. That's what I need. 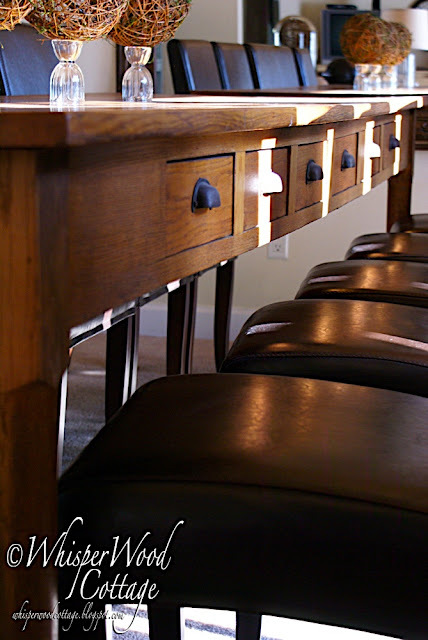 A dining room table with storage! You can never have enough. Love the table and your clever egg cup idea. Looks great. You did a great job on your photography! 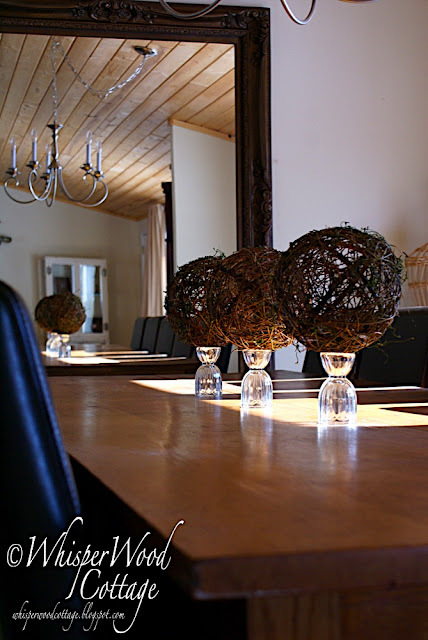 I love the spheres AND that table!! !